Talented young athlete Isaac Akers, aged 17 from Market Harborough, headed to Tbilisi, Georgia to represent Great Britain at the inaugural European Youth Championships which took place from 14th to 17th July, 2016. Isaac - a member of Corby Athletics Club - proudly wore his first ever GB vest in the 3000 metres event. Isaac put in a solid performance, running his second fastest time this season over 3000m in incredibly hot conditions. Sadly, he narrowly missed out on the medals by coming fifth out of a field of 20. His time was 8:23:68 (which compared well with silver medallist time of 8:20:29 and bronze 8:20:94), and he was in contention until the sprint finish but had very little left to give at the end of the race. He and quite a few of the GB athletes had a stomach bug and were being treated by their medic, so given the heat and his illness he performed brilliantly. Isaac said: "It was a fantastic experience and I ran well. This GB experience has made me even hungrier for future success in both athletics and cross country." Isaac receives financial support to achieve his sporting dreams from local charity The Travers Foundation. The Travers Foundation helps 13 to 30 year olds living in Northamptonshire, Rutland or Leicestershire improve their skills in sports, the creative arts and the performing arts. The charity provides monetary assistance to Isaac for coaching and competition expenses. As of September 2016, Isaac is ranked 12th in the UK for U17M 3000m and 1st in the 3000m Midland Counties Championships U17M. 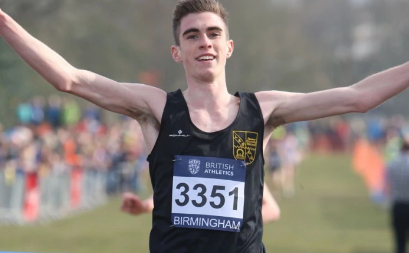 He also played a key role in the Corby AC men's team which qualified for the national final of the six-stage road relay championship when they finished 23rd in 2.03.47 at the area showpiece held at Birmingham Sutton Park. Isaac got them off to a superb start on the opening leg of the 5.88km finishing third with the 10th fastest individual time of the day of 18.15. In October Isaac was awarded, Corby Borough Council Young Sportsperson of the Year 2016. The citation stated "Isaac has been a credit to himself, his club and has been a great ambassador for the town. He has won National titles in the past year, competed at top levels after representing Great Britain in the European Athletics Championships and ended the year ranked 3rd in Europe and 8th in the world for his main event, the 3000m. Isaac is County and National Cross country champion and took a bronze medal at the English Schools cross country championships. On the track Isaac was selected to represent Great Britain, finishing 5th in the 3000m final. He is a great inspiration and a great role model for any budding athlete."